On the night of March 24th, 1944, Bram (Bob) Vanderstok was the 18th of 76 men who crawled beyond the barbed wire fence of Stalag Luft III in Zagan, Poland. The 1963 film The Great Escape made this breakout the most famous of the Second World War but this is the true story of what really happened. 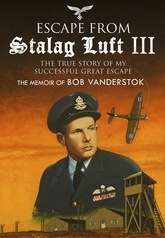 Vanderstok's memoir sets down his wartime adventures before being incarcerated in Stalag Luft III and then, in extraordinary detail, describes various escape attempts, which culminated with the famous March breakout. After escaping, Vanderstok roamed Europe for weeks before making it back to England. He reported to the Air Ministry and three and a half months after escaping, he returned to the British no. 91 Squadron. In the following months, he flew almost every day to France, escorting bombers and knocking down V1 rockets.